"Self-care is a sacred responsibility." Gentle Flow Yoga: This is a wonderfully fluid class, where we flow like a dance from one pose to another. We warm, then stretch and strengthen the muscles. This is a beginning to intermediate class that helps open, strengthen, and energize. ​Up-dog: remember to press firmly into your full hand not just your wrists, relax your shoulders down, and if you are tight do a few up-dog pumps before holding this pose. This is a great pose to do after a long day of arching over the computer. This pose opens the chest and heart increasing vitality and life-force. Star Gazer: press into all four corners of your grounding foot and grab your ankle. 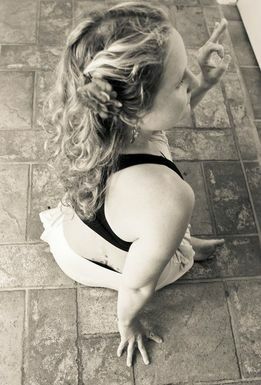 Find a point to focus your gaze then push your foot away as you pull your leg to you and you will open into star gazer. Remember to flex your foot and keep your hip down and stack ankle over the knee. This is wonderful for improving balance, opening the chest and hips, and stilling the mind. Crazy Dog: sit on the ground with the wall to your back in extended legs and reach to where your feet are. 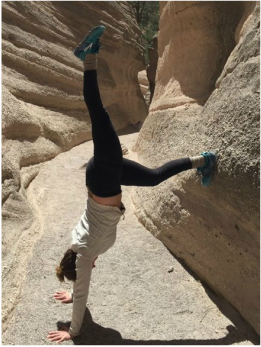 Put your hands where your feet were and press into then while climbing the wall with your feet until your feet are in-line with your hips, when you feel balanced lift one leg. Remember to press into the full hand and not put all the pressure into your wrists. This is wonderful for balance and arm strength, this pose will also shift your thinking and help you gain confidence. 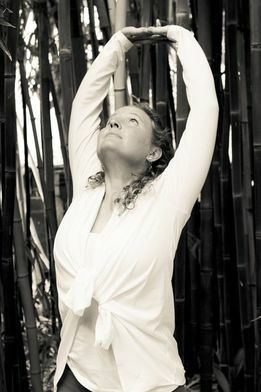 Chest Opener: Interlace your fingers and reach your arms above your head. Press you fingers towards the sky, relax your shoulders, look up, and take five deep breaths. This pose is excellent for all of us who work on computers, drive, cook, or who round our shoulders and look slightly down during the day. This will help you stay happy, confident, and full of life. 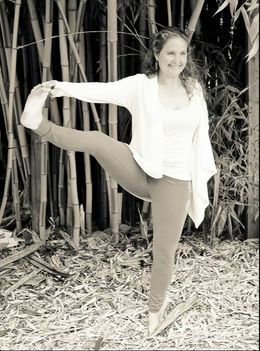 ​Wide Leg Balance: start by tucking your knee into your chest and then grab your big toe with your fingers. Slowly extend your leg straight, then slowly bring your leg to the side. If you wobble or fall that is part of the fun! Try to take five to ten deep breaths here. This is excellent for increasing confidence, balance, and is a nice hip and leg opener. Pigeon with Quad Stretch: find a nice bench, haha, no.. use your mat (don't be like me). Start in down dog and come into pigeon pose by sliding your knee in between your hands. Make sure your hips are even and relax onto your forehead for ten breaths to enjoy a nice hip stretch in pigeon. When your hip feels nice and open then grab your back ankle and press both hips to the floor. you can rise your arm and do the peace mudra or you can use your hand to balance. Take about 5-10 deep breaths here then repeat on the other side. This is wonderful for releasing old grief, decreasing back pain, increase range of motion in the hips, and wonderful for relieving sciatica. Seated Twist: I love this pose! You can do it sitting in a chair, on the floor with one leg straight or with both legs bent. Start by bending the left leg and bringing your left heel by your right bun. Cross your right leg over the left with the right foot flat on the floor. Imagine you have a string at the top of your head pulling your spine straight and from this twist to the right. Use your left elbow on your knee to deepen the stretch. Look as far to the right as you can so that you get a neck and eye stretch as well. Hold for 5-10 breaths, then switch sides. This pose is amazing for relieving back pain, constipation, and stuck energy. ~ If you commit to a weekly or bi-weekly yoga class or practice, you will begin to get closer to touching your toes, and you'll be able to do poses you thought were impossible. ~Why is it important? Tight hips can strain the knee joint out of improper alignment of the thigh and shinbones. Tight hamstrings can lead to flattening of the lumbar spine, causing low back pain. ~Strong muscles protect us from back pain, injuries, and more. ~Yoga is more beneficial than lifting weights because it increases flexibility while strengthening. ~During yoga, your joints go through their full range of motion. This squeezes and soaks these areas with fresh nutrients and lubricant, which keeps them healthy and mobile. ~Spinal disks are the shock absorbers between the vertebrae that can herniate, burst open, exposing bone to bone and causing nerves to be pinched. ~These disks need movement-this is the only way they get their nutrients, preventing them from bursting. ~By moving in all directions with backbends, twists, and forward bends, you lubricate your disks with synovial fluid- keeping them nourished and agile. ~Weight bearing yoga poses increase bone density, such as: downward-dog, goddess, warrior, plank, up-dog, and many more. ~Yoga also lowers cortisol levels, increasing calcium in the bones. ~Relaxation exercises increase blood flow to the hands and feet. ~Twisting poses wring out venous and deoxygenated blood from the internal organs, and allow fresh blood to flow out once the twist is released. ~ Shoulderstands encourage venous blood from the legs and pelvis to flow back to the heart where it can be pumped back to the lungs to get freshly oxygenated. Inversions help if you have swelling in your legs from heart or kidney problems. ~A regular practice gets you moving and feeling good in your body. ~The spiritual and emotional dimensions of the practice can often encourage healing of the cause of over/under-eating. "After 4 years of yoga classes, Vanessa's are my favorite. 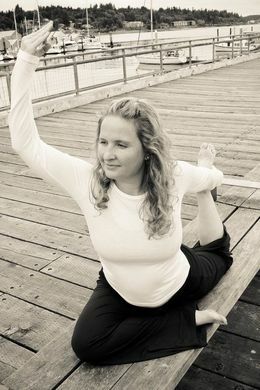 To each class, she brings clear instruction, intuition, and mixes in bits of yogic philosophy, general health education, cultivation of a connection to the earth, and even humor! Each class balances resting, strengthening, stretching, balancing, breathing, and tension relieving poses- I truly leave each class feeling renewed and revitalized. I highly recommend Vanessa's yoga classes!"